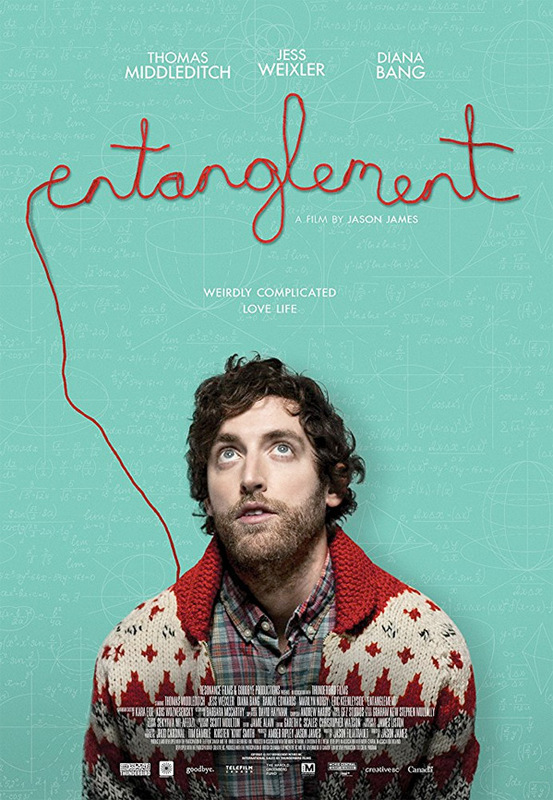 "Every choice we make creates thousands of universes, spreading throughout time and space…" Dark Star Pictures has released the official trailer for an indie "alternative" romantic comedy titled Entanglement, from filmmaker Jason James. The film first premiered at the Seattle Film Festival and stars up-and-coming awkward actor Thomas Middleditch and the talented Jess Weixler (from Teeth). The story follows Middleditch as Ben, a man who accidentally falls in love with a girl who was very nearly, almost his sister while recovering from a suicide attempt. Then things get weird. The full cast includes Diana Bang, Randal Edwards, Marilyn Norry, Eric Keenleyside, and Nicole LaPlaca. This looks like one of those ideally quintessential indie films with all the right romantic touches and existential questions, and I want to see it. While searching for the meaning of his existence, Ben Layten (Thomas Middleditch) uncovers a family secret that leads him to a woman named Hanna (Jess Weixler)… But when he and Hanna inadvertently fall in love, his life becomes increasingly and strangely complicated. Ben starts to realize that everything is amazingly and incredibly connected - and that the world might just be more inexplicable than he ever imagined. Entanglement is directed by Canadian filmmaker Jason James, of the indie film That Burning Feeling previously and producer work. The screenplay is written by Jason Filiatrault. This first premiered at the Seattle Film Festival earlier this year. Dark Star Pictures will release Jason James' Entanglement in select theaters + on VOD starting February 9th, 2018 next year. Who's interested in this film? Thoughts?